I got a chance on Friday to get out to an estate sale. It wasn’t as cold as my last one, but it was a doozy. It was a small three bedroom house packed to the gills with crap. OK, one man’s crap is another one’s treasure, but still it was about as packed of a house as I’ve seen. So packed you had to walk through a narrow path in most of the house. Past boxes piled upon boxes mounded upon more boxes. I have no desire (or room in my house) to spend $10 on a box full of stuff that might only have one or two things in it that I really want, so I didn’t spend a lot of time digging in the boxes. But I did find a few individual things. 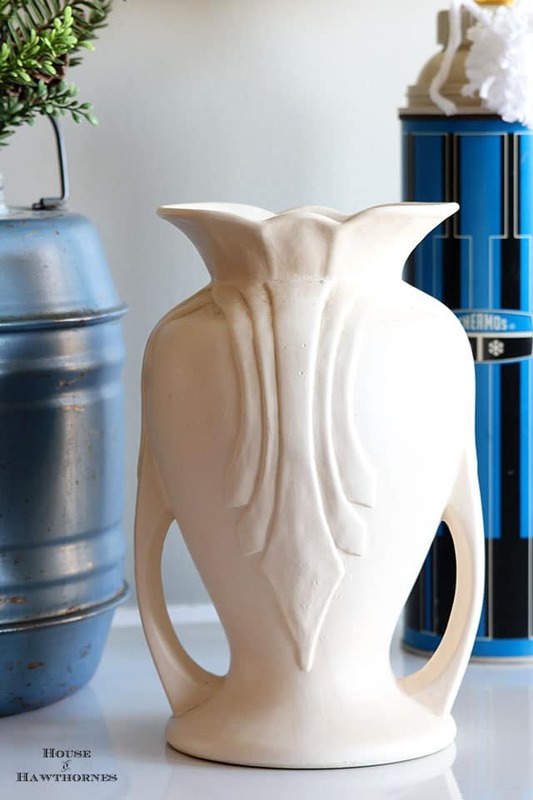 This vintage white pottery vase is marked USA 49 9 on the bottom. It really reminds me of Roseville Pottery in both shape and matte finish, but it doesn’t actually say Roseville on the bottom. Let’s just say its maker is still to be determined. This vintage beehive . . .
is a set of nesting measuring cups made by Menschik Goldman, Inc.
OK, I have to admit that as I was wandering around the house with it in my grip, I kept wondering why there were birds flying out of the beehive. It wasn’t until I came home and researched it that I realized that yes, they are BEES. No idea why they are different colors though. BTW, World Market sells reproduction ones, except they actually have yellow and black bees like God intended. 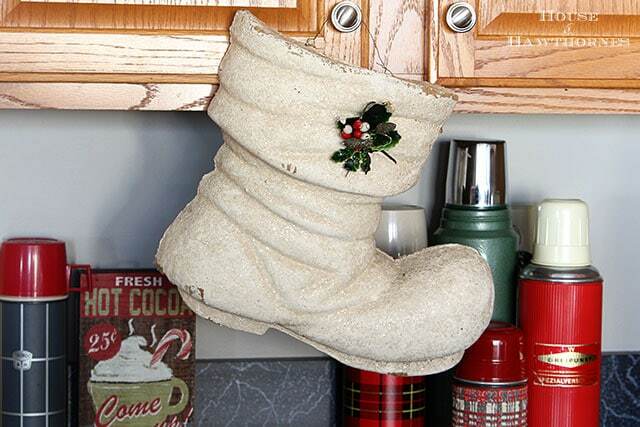 I found this vintage white paper mache glittery Christmas boot hanging out in the garage. So much of the other things I had mentally made note of in the ad were not there, so I’m taking this as a sign that it was meant to be mine. 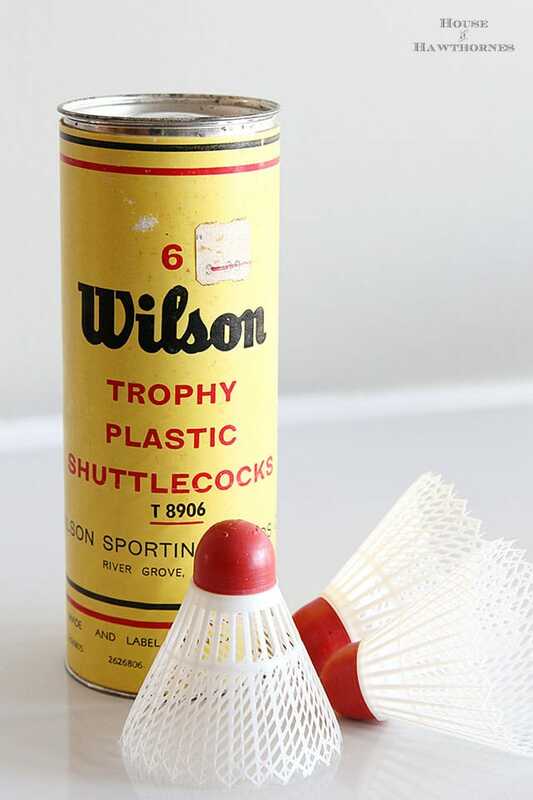 These Wilson plastic shuttlecocks may make it into a vignette this summer. I had looked all over for some last year to go with my badminton rackets I had found at a sale, but all I could find were newer neon colored ones. And neon does not scream vintage vignette to me. The rackets ended up as part of my vintage eclectic hallway decor, so I’ll probably toss these in a silver bowl on the rolling cart in the entryway and voila instant themed vignette. Have you been to any good estate sales lately? Any good hoarder sales? Previous Post: « Random Meanderings aka Squirrel! Keep up the good hunt! Love your finds. But my favorite, I must say is that BEEHIVE. It is so charming. I adore the beehive too–you find the cutest things! I had the pink set of those measuring cups! I recently sold them on IG. Out with the old, in with the new and better old! For whatever reason, there are a ton of good sales this weekend in my area. I hit a couple but am staying home today. The painters finished yesterday so I can finally put the guest room together. And to be honest, I really don’t have any room to bring home any more stuff right now. Did I really just say that? Have an awesome weekend, Pam! It might be. I never thought of Hull, but I do have another one of their’s that has the same finish on it??? 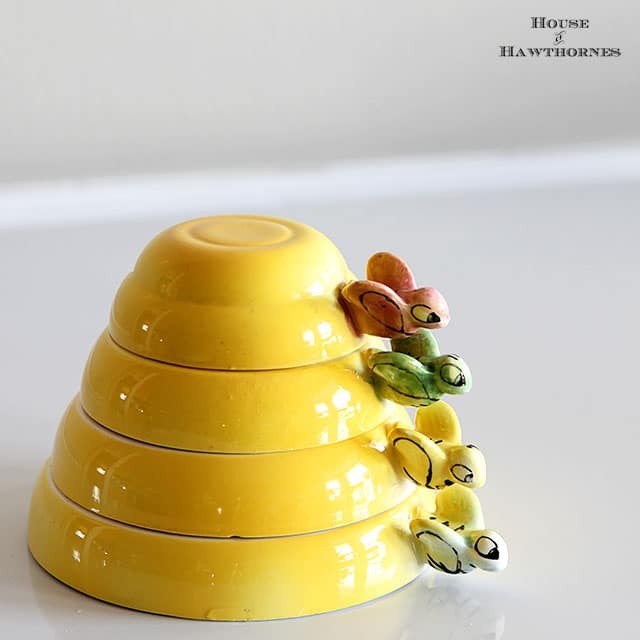 Neat finds Wow to that vintage beehive… LOVE IT! Those beehive measuring cups are fantastic! I’m so ready for a good estate sale. It’s been so long since I have any estate sale adventures. 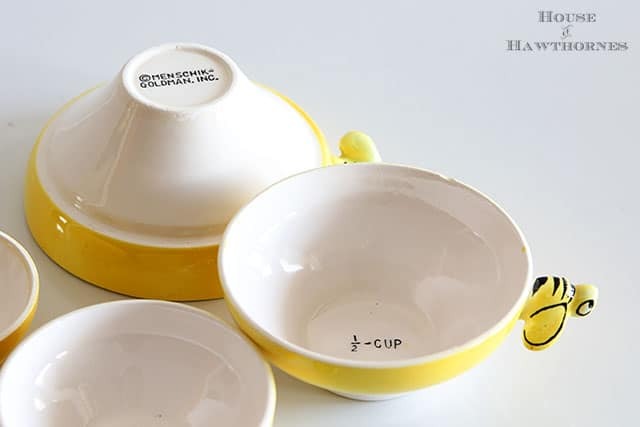 Those beehive measuring cups are adorable! That cute boot was definitely meant to be yours. The sales are still few and far between around here. You found some great items. Anxious to see what you do with them. I always love your finds…and the beehive is wonderful!